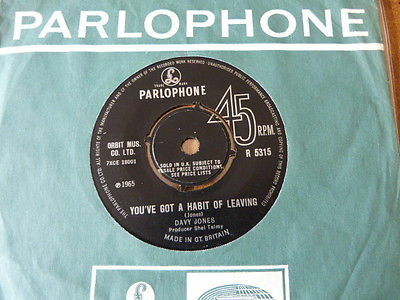 On offer is a highly collectableoriginal UK stock issue 7" single by the artist Davy JONES. (David BOWIE). Side 1: You've Got A Habit Of Leaving. Side 2: Baby Loves That Way. Label: Silver / Black Parlophonelabel. The downside, the record is onlyaroundFAIRcondition. I would not normally list any record less than very good but this is such a rare and desirable item. I remember my father telling me (His collection) that the record had not been stored properly when he got it. Apparently it had beenboxedwithout a sleeve amongst other records, which causedsurface scuffs/marks/scratches. So if you are looking for anything like a Mint/Ex copy this is not for you. It comes housed in anoriginal factory bag. This record wasstored as part of a BOWIE collection for well over 20 years, in the hope of a better copy turning up. It never did!!! This BOWIE titlehardly ever gets offeredin any condition, so do not miss this opportunityor good luck waiting and start saving up now. Please note I do not use the term MINT unless a record is brand new or I know it has never been played.